I'm a huge fan of Simon Brett and I may not be capable of giving him less than 4 or 5 stars. He's one of the five authors I would take to a desert island. So realize as I write this review of his newest Fethering mystery that I am a huge fangirl. All that said, I think this one lives up to what I've come to expect of him. It's fun and twisty and the characters are colorful. Jude is as free a spirit as you'll ever meet and Carole is as uptight as a person can get. Does traveling together really seem like a good idea? Jude gets the opportunity to use the villa of an old friend for a vacation. The villa happens to be in Turkey. Carole is not at all sure that this makes any sense, she hates to leave her granddaughter and she's sure she will be sick the whole time but after much shilly-shallying she decides to go. Packing her Imodium, of course. As she suspects, the old friend is an ex-boyfriend of Jude's who's wife is a bit on the jealous side. Jude starts to wonder if she's made a terrible decision, inviting Carole to go. It should be a great vacation. I love to travel so the plot already had me intrigued. 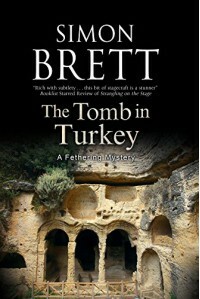 It does, however, have a little different feel than most of his other writing because usually his books are so very British and this is set in Turkey. There are murders, there are suspects galore, there are weird neighbors, there is an exotic setting and there is the fabulously witty writing of Simon Brett. I thoroughly enjoyed it. I received this from Netgalley in exchange for an honest review but I would have bought it when it came out if I hadn't been able to get it from them. Yeah, lifelong fan of Simon Brett.